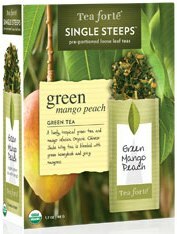 Fragrant mangoes and peach scent every cup of our lightly steamed green tea with honeybush and a touch of peppermint. I received a “single steep” package of this tea along with my KATI tumbler, and before I get too deep into reviewing this tea, I want to say that I just love these single steep packages! They are pre-measured with just the right amount of tea for my KATI cup. Armed with the KATI tumbler and some of these single steep packages, a tea lover has just about everything they need to brew a delicious cup of loose leaf tea anywhere they go! Just add hot water! Now… on to the tea! 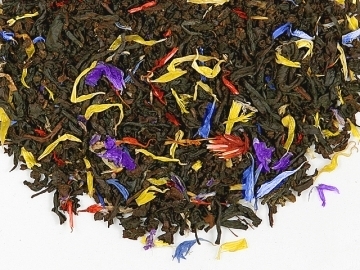 The flavors of mango and peach permeate each sip of this tea. It is intensely flavored! The green tea base is able to hold its own though, and isn’t overwhelmed. I can taste the fresh, light taste of green tea in the background. Less noticeable is the flavor of the honeybush, although I can taste the honey-like sweetness from it. The mint in this blend offers a herbaceous, somewhat medicinal taste to the cup that is reminiscent to menthol. I don’t find this to be off-putting, but I can see how others might. The flavor doesn’t overpower the cup, and I will say that the mint flavor lends a very nice minty aftertaste to the tea experience. I like the ginger’s presence in this cup. It is not too strong, but it adds a nice dimension of flavor and cuts through the sweeter notes of the fruit. It has a well-rounded taste to it. A lovely afternoon cuppa! 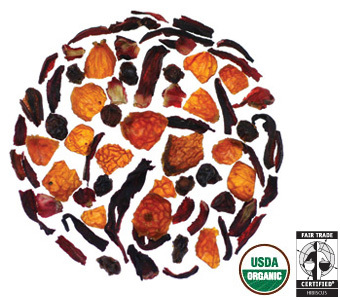 This enchanting oolong is softly flavored by the wonderful union of red aronia berries, bright mango cubes, passion fruit and dark red rose petals. A royal treat for even the finest of palettes. *Vary time according to taste, & remember that steeping tea leaves beyond 3 minutes does not contribute to flavor, only bitterness. 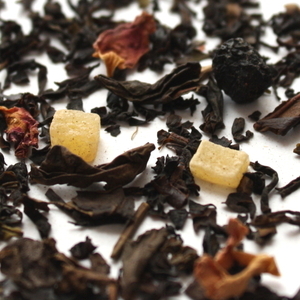 DRY – Oolong Royal Tea from Praise Tea looks like a woodsier Oolong mix. The aroma is mostly oolong and mango. I can tell there is a little something else fruity-wise too but it’s not really identifiable as berries or passionfruit. Once infused the liquor is pretty dark for an oolong- much like a medium-brown colored black tea. It smells slightly fruity and woodsy. The taste is DARN GOOD. It’s a smoother oolong taste with hints of sweeter-wood but the fruit notes pair up beside the oolong very well. All of the fruit ingredients mesh well with each other and no one ingredient really barges in front of the others. The rose hides out in the background and if I didn’t take the time to really notice it I probably would miss it. Blue Mist is a blend of Jackfruit (a fruit from India with an aroma of banana and pineapple), Apricot and Mango black teas with cornflowers and marigold petals. Brew tea at 212º – steep for 3 minutes. It smells nice…you can tell Mango and Pineapple but there is a little hint of something else which I will ‘chalk up as’ that banana illusion. Nothing is too over the top to make me change facial expressions – like I normal would when smelling bananas – but it does have a different sort of aroma, that is for sure! It’s VERY dark in color. It tastes like a HOT tropical smoothie. Not really floral but fruity and not like Pina Colada but truly unique. Almost like a tropical drink with NO Pineapple, Coconut, or Flowers in it…if you can picture that. It’s much different than ANY flavored black I have tried to date. If you are looking for something different this just may be it. Packed full of delicious tropical ingredients, Gold Rush Tea definitely tastes as good as it looks! Luscious bits of mango serve as mood enhancers while passion fruit helps revitalize your body! The colorful and aromatic brew is gently touched by delicate floral notes of cornflowers, blue mallow flowers, safflowers, and marigolds. The vigorous black tea provides soothing body and warmth to this delicious tea that is soo sweet to sip on. This is a pleasant tropical blend. The aroma is very fruity and smells delicious. The leaf cut is very small on this blend, much smaller than the photograph led me to believe – other than that, though, the tea looks very much like the photo. 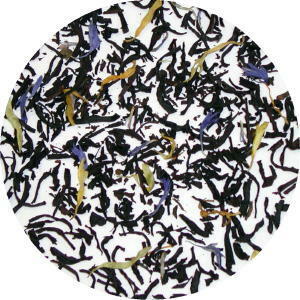 With the beautiful petals scattered throughout the blend, it is bright and colorful. The black tea is front and center with this cup, especially when first sipping. As I continue to sip, the fruit flavors develop a little more. The black tea is delicious and brisk. It has a very smooth character and has no bitterness and some astringency. It isn’t an extraordinarily drying astringency, but it does leave the palate ready for the sweet fruit finish. The mango and passion fruit in this blend unite almost seamlessly. The flavor is sweet and very tropical. No tartness, nothing unpleasant, no surprises. It is just delicious! The flowers in the blend are there primarily for aesthetic purposes, as they do not pose a prominent flavor in this cup. I can taste very faint, generic floral tones that kind of come and go in each sip, but, they are barely noticeable when casually sipping. This is a very appealing tropical blend that I’ve enjoyed very much. On a chilly afternoon like today, it transports me (mentally!) to a much warmer climate, complete with palm trees and sunny, sandy beaches! 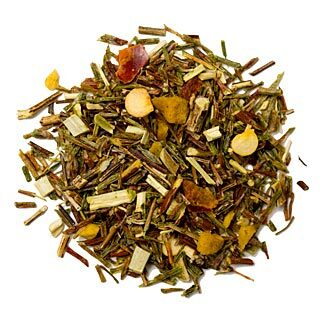 And as I write this, I noticed that Red Leaf Tea is offering 10% off this blend – plus FREE shipping! Yay! On the one hand, this exclusive, flavored Oolong tea will strike you with the soft, spicy cup of the well-known Chinese Oolong tea and, on the other hand ,with the intense flowery soft note of the Lotus Oolong. This scented creation is rounded off pleasantly with the fresh flavors of ripe passion fruits and apples, and sweetly decorated with pink rosebuds and bright Roman chamomile. 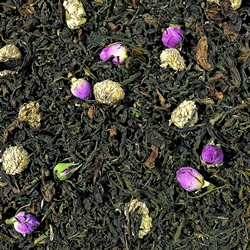 The aroma of this tea is very alluring: it’s like a tropical fruit salad with strong notes of mango and passion fruit, and there are delicate rose notes in the background. These essences translate into the flavor as well. I am primarily tasting the mango flavor but I can also taste the flavor of peach nectar and even a hint of apple. It is sweet and very juicy. The tea flavors also come through. The Oolong is a dark Oolong – which indicates a long oxidation time. This is the perfect Oolong base for these fruit flavors, because I’ve found that the darker Oolongs tend to have a natural fruit-like flavor to them. That fruit taste enhances the flavoring very nicely. This tea also possesses a nutty quality and a light buttery tone. The flowery notes are a little more present in the scent than in the flavor, but I can taste faint floral characteristics to this cup. The union of all these flavors makes for a very ambrosial taste! Delicious!